here’s an old axiom that all health care is local, but in the future it also will be highly personalized and the results may be astonishing. With the emergence of precision medicine, treatment is tailored to each patient’s unique genetic or molecular profile and condition. What’s particularly noteworthy, especially for self-insured employers, is the opportunity to prevent disease, improve clinical outcomes and reduce costs not only for group health plans, but also prescription drug benefits, behavioral health and workers’ compensation programs. including a pharmacogenomics test, can evaluate how hundreds of drugs interact with an individual’s genetic makeup and suggest an ideal clinical pathway for each patient. Their power is undeniable as more self-funded plans seek better control of rising costs and chronic illnesses. Advisors, whose mission is to provide affordable genomic tests as a voluntary benefit for the average employee with a more costly version for executives. Precision medicine tailors treatment and medication to an individual’s DNA and ideally takes into account factors that can influence one’s propensity for developing a disease, explains Angelika Erwin, M.D., Ph.D., executive medical director of the CarePathConnect service who practices clinical genetics with the Center for Personalized Genetic Healthcare at the Cleveland Clinic. They include environment, exposures, nutrition and family medical history. Wamberg envisions a future wherein doctor office visits feature a small machine that reads a patient’s DNA once a finger is inserted and immediately prints a data file. That information, which sequences each individual’s genome and uncovers mutations based on 6.4 billion nucleotides, is then sent to a pharmaceutical company, along with an electronic medical record, that will customize a drug to treat the patient’s specific ailment. It’s only been 17 years since there has been an ability to sequence the human genome, he explains. But having finally cracked the code on the genome, his sense is that all medicine eventually will provide genetic answers from a treatment perspective. She cites evidence that the person’s genetic makeup plays a role with regard to their susceptibility to common disorders such as diabetes, hypertension and cardiovascular disease. Genetic testing can be used to personalize knowledge about risks for disease and suggest, for example, the most appropriate chemotherapy for various forms of cancer, she adds. This avoids side effects and efficient care, while also shortening the course of treatment. As for today, he notes that a cancer genomic profiling test is currently available, albeit in crude form, which suggests some targeted treatment therapies from each individual’s mutations. Cancer most certainly is the operative word when it comes to applying precision medicine and the potential for improving outcomes and saving money is substantial. As much as 28% of cancers are misdiagnosed in the U.S., according to Wamberg. “Genes aren’t your fate, but in many cases, they show you where your fate may go,” he says, noting that informed patients will make better health care choices. With cancer drugs totaling $400,000 a year, any misclassification of a cancer type “becomes a huge cost and a danger to the patient,” Amir Trabelsi, co-founder and CEO of Genoox, recently cautioned in a MedCity News commentary. A related point he makes is that it’s worth investing a few thousand dollars in genetic tests designed to identify the precise combination of pharmacogenetics vs. having patients risk spending upwards of $20,000 to $60,000 a month for drugs with little or no efficacy. Drug dilemma Software is now available to make precision medicine scalable at the pharmacy benefit management level (PBM) so that more patients can benefit from this approach, according to Becky Winslow, PharmD, a certified pharmacogenomics educator and business developer for GENEious RX, LLC who also heads up clinical and regulatory operations for My1Lab. But therein lies a dilemma: more precise medicine will reduce polypharmacy (defined as “the simultaneous use of multiple drugs to treat a single ailment or condition”), and by association, the number of Rx transactions, she explains. The Food and Drug Administration (FDA) is pressuring drug companies to no longer produce medicines whose efficacy is unknown beyond white males for whom most medications on the market were designed, Winslow adds. medications with adverse reactions that she says average $30,000 for each hospital admission. She notes related costs to employers in the form of longer disability claims and decreased productivity. Although everyone has a stake in precision medicine, Wamberg believes self-insured employers clearly have more of a vested interest by virtue of their own dollars being spent on treatment that may or may not work. Precision medicine is gradually worming its way into self-insured plans. For example, Winslow notes that NVIDIA Corp. provides cancer diagnostic genomics for its employees to help prevent or slow onset of various deadly diseases and the damage they inflict. The company also extols the value of knowing one’s genetic status. Another early adopter is the Kentucky Teachers Association, which offers pharmacogenetics testing. “Self-insured employers are in a perfect position to drive these changes as an example for others because they do have more say-so over their PBMs,” she says. Knowing a patient’s family medical history can be a powerful tool for early detection of a genetic predisposition for cancers and increasing the chance of a good outcome, Erwin says. Preventative measures can be taken to completely avoid cancer, she adds, noting there’s a 90% chance that someone who is determined to have a mutation will develop cancer down the road. In addition, Erwin says pharmacogenomics testing helps clinicians prescribe psychotropic medication to treat depression, anxiety and bipolar disorder, as well as pain medication. For some conditions, she says there’s evidence – though still in its infancy – that tying medication and dosage to genetic makeup “can make a huge difference” in health outcomes. A more useful comparison, she says, is between genetic testing and screening for any mutations. The former involves someone who already has a diagnosis, whereas the latter involves a healthy individual who doesn’t have any symptoms or a family history that would prompt a search for diseases. It’s also worth noting that lower prices, better interpretation tools and clinical improvements have fueled widespread use of screenings. There has been an explosion in the number of genetic tests to about 60,000 different types, reports McKee, whose firm recommends which genetic tests be run through its genetic counselor network. But here’s the rub: since they’re not regulated by FDA, he suggests that employers seek guidance on which ones to conduct from one of the nation’s roughly 900 medical geneticists or 4,000 genetic counselors. In fact, he says a genetic counseling recommendation, along with providing family medical history, are two conditions that must be met for reimbursement of a genetic test. Operating on the assumption that 5% of about 325 million people in the U.S. are at high risk and 20% moderate risk for developing some type of disease based on family medical history, McKee sees tremendous promise in precision medicine. Genetic vs. genomic testing While the terms genetic and genomic testing are often used interchangeably without much distinction in the clinical field, Erwin describes the latter as all-encompassing and former as involving a geneticist or a genetic specialist. While genetics can help determine health status or risk for certain diseases or conditions, genomics can lead to a deeper understanding that results in more effective preventive measures or treatments. One timely application for precision medicine is for the self-insured community to wrest control of the opioid epidemic, which not only spikes medical costs, but also reduces productivity. “There are ways to create algorithms that identify steps to prevent opioid addiction based on non-genetic factors,” says Holohan, whose firm mines genomic and focuses on interaction between an individual’s genome and environment as it relates to specific phenotypes. 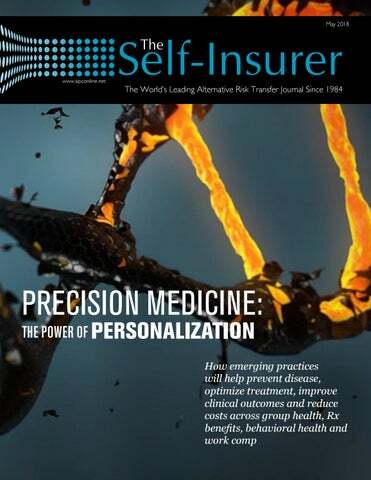 Still, the prospect of personalized medicine becoming a standard part of all treatment represents a compelling notion that the self-insured community will continue to track for years to come. In essence, machine learning could be used to detect patterns in a patient’s billing behavior that may be associated with risk for, or the presence of, opioid addiction. “At that point, it could be used to target interventions to either prevent or get that person help before it gets really bad,” he explains. Solutions may include a non-opioid painkiller or physical therapy program to eliminate the cause of pain rather than just treat the symptom. ecruiting young talent for the insurance industry has been a real issue for nearly a decade, but with the expected mass retirement of insurance leaders over the next few years, the issue has become critical. Insurance companies are seeking out new ways to attract professionals 35 and younger, most often referred to as the millennial generation. The captive sector is likely to be hit even harder than the insurance industry as a whole, given the insular nature of captives and that many of todayâ&#x20AC;&#x2122;s leaders have grown with the industry since its rise in the 1980s. Statistics released in 2016 by the Bureau of Labor Statistics estimated that 400,000 insurance professionals would be retiring by 2020. At the 2017 Captive Insurance Companies Association (CICA) annual conference, outgoing president Dennis Hartwick started the conference by noting that 25% of the captive insurance workforce could be retiring during the next five years. Hartwick himself retired in June of last year. Cañas and Carly Burnham, both young insurance professionals who see the value in making a career out of insurance, published a book in 2017 titled Insuring Tomorrow: Engaging Millennials in the Insurance Industry. The book addresses the “talent crisis,” offering suggestions in how to attract quality candidates to the insurance sector. According to the Cañas and Burnham, the average age of an insurance professional in the U.S. is around 60 years old and only 25% of the workforce is under 35. The Recruitment Gap When young professionals and college students think of exciting careers, insurance does not usually come up on the list. One of the oldest financial professions, insurance is considered to be mundane, even boring to those people who grew up with the internet. Older generations tend to think of millennials as mobile phone-focused and as underachievers, but the truth is more complex than that. with the same company. Millennials aren’t looking for careers that are repetitive or will leave them bored. They are looking for careers that will allow them to solve complex problems in creative ways. The intersection between what millennials want in a career and what they perceive insurance to be is what attracts the interest of so few young professionals. The whole of the insurance industry has a lot to offer the millennial generation, especially as parts of it are rapidly changing through technology, but the captive sector has even more to offer them. Captives offer the long-term creative, entrepreneurial, and growth opportunities that they seek. The dynamic nature of captives can offer young professionals the growth they are looking for. The flexibility of self-insurance and the unique problems it presents can give millennials the chance to tackle new challenges on a regular basis and to use their problem-solving skills to solve real world issues. Best of all, the captive industry offers the opportunity for growth, setting a course for leadership positions. The hard part is in reaching out to the under-35 crowd so that they are aware of the opportunities available to them. The self-insurance and captive industries are looking to engage head on with young professionals, to show them how much the industry has to offer. SIIA Future Leaders In early April, SIIA announced a new initiative to reach out to young insurance professionals. The initiative, SIIA Future Leaders (SFL), is designed to encourage young talent to become involved in the self-insurance industry and to become members of SIIA. The Future Leaders Committee has been formed to take the lead in identifying engagement ideas to reach out to young insurance professionals and those just entering the workforce. The goal of the committee is to help foster a community of young professionals involved in selfinsurance and alternative risk insurance sectors, and to help prepare them to be tomorrow’s trailblazers. SIIA is proud to have many industry leaders in the association and by fostering up-andcoming professionals will help to make the next generation of leaders in the industry. The first step in launching SFL is to attract young professionals to SIIA’s National Conference & Expo, coming up in September in Austin, Texas.Young professionals, considered to be those 40 and younger, will be eligible for a discounted price for the conference. There will also be networking opportunities aimed towards SFL, as well as more educational tracks geared towards entry and mid-level insurance professionals. This is the first step in a years-long process SIIA is undertaking to help close the talent gap in self-insurance. Reaching Out to Emerging Professionals In time for Insurance Careers Month, now in its fourth year, Gamma Iota Sigma—a business fraternity for students of risk management, insurance, and actuarial science—held a groundbreaking event in February. Called The Pipeline, the event was an online virtual career fair helping to pair students with potential jobs. Thirty companies and more than 700 students participated. virtual “booth” staffed by multiple recruiters and offered open positions. Companies reported over 5,000 unique “booth” views and 1,395 interviews were completed via direct chat. Last September, CICA announced a new mentorship program that seeks to pair experienced captive leaders with new and mid-career professionals. The mentorship program is available to members or affiliates of CICA. Those seeking to participate can fill out an online form on CICA’s website and be paired with an appropriate mentor/ mentee. CICA further promoted their mentoring program by hosting mentors and their mentees at their annual conference this past March. The mentoring program at Butler University’s Lacy School of Business has taken the introduction to captives a step further. Last year students in the Davey Risk Management and Insurance Program at the university had the opportunity to launch an actual, viable captive insurance company. The captive, MJ Student-Run Insurance Company Ltd., is domiciled in Bermuda and will self-insure a variety of risks for the university—including its celebrity bulldog mascot, the university’s fine art collection, and student-run start-up companies at the university. The “talent crisis” is a looming issue for the captive and self-insurance sectors. By focusing on reaching out to the millennial generation, industry leaders are making the crisis into a turning point, grooming tomorrow’s leaders today. wo years of diligent advocacy by SIIA members of the Enterprise Risk Captive (ERC) Task Force and government relations staff came to fruition when clarification of how a captive insurance company can qualify for IRS Code 831(b) tax status was included in the 2018 Omnibus Appropriations Act passed by Congress early this spring. ERCs are a self-insurance solution used by increasing numbers of smaller and mid-sized companies to insure a variety of risks for which coverage by the traditional market is considered too expensive or is not available. Smaller captives are part of the growing trend of companies using multiple self-insurance aspects as part of their overall risk management strategy. •	Clarifies “look-through” language to the insured policyholders regarding the first diversification test. The original PATH Act language specified that no more than 20% of risk could attach to a single policyholder. Now the test will “look through” to the captive’s underlying policyholders for this purpose. •	Clarifies the definition of “specified asset” under the second diversification test. In considering relevant specified assets for purposes of establishing captive ownership, unrelated premium won’t dilute the ownership percentages. •	Removes spouses of captive owners from consideration regarding specified ownership of the captive, a clarification to address concerns surrounding community property and spousal attribution issues. Members of SIIA’s ERC Task Force worked tirelessly to educate members of Congress about the need for vital clarifications of the PATH Act. They met with members of the House Ways and Means Committee, Senate Finance Committee, the Joint Committee on Taxation (JCT), other relevant Congressional committees, plus key agency staff. Simpson credited the dozen members of the ERC Task Force who participated in many Congressional meetings. “Over a two-year period they did a great job of identifying issues and boiling them down to explain and present them. They educated Washington, D.C. on how ERCs work.” “This was very good news for owners and managers of ERCs, following on the earlier passage of the Protecting Americans from Tax Hikes (PATH) Act of 2015,” said Ryan Work, SIIA’s vice president of federal government relations. “SIIA has been the leading voice in the drafting and passage of the PATH Act, including these recently passed clarifications,” Work said. SIIA’s efforts on behalf of ERCs will continue, Work said. “We don’t know when the Treasury Department and the IRS will come out with guidance on how the clarified PATH Act will work,” he said. “Over the next few months we’ll be working toward regulatory language that reflects the intent of the law.” Work invites SIIA members’ queries or comments at rwork@siia.org. Reducing workers’ compensation costs can be a difficult challenge, especially if you’re a selfinsured group. Learn how this 300-member auto group covering 25,000 employees made major advances in their workers’ compensation program—and paid out more than $23 million in dividends to its members. he automobile industry was hard hit when America fell into the Great Recession a decade ago. As lending tightened and consumer spending plummeted, automobile manufacturers filed bankruptcy and dealers closed. The members of the Virginia Automobile Dealers Association (VADA) Group Self-Insurance Association (GSIA), which provides workers’ compensation insurance for roughly 75 percent of franchised new car and truck dealers in Virginia, were no exception. While VADA GSIA made great strides improving safety and reducing losses from 2000 to 2008, the recession led to more than 75 dealerships going out of business in Virginia. Those that survived cut costs and consolidated. The resulting decline in employment reduced the VADA GSIA’s workers’ compensation premiums, while dealerships strained to maintain safety standards and strategies such as returning workers to modified duty. By 2012, the economy had improved, dealers were poised for growth and the time was right for VADA to advance the workers’ compensation program for their self-insured group. Led by Don Hall, VADA President, Michael Allen, VADA GSIA General Manager and their TPA, PMA Management Corp., VADA GSIA took a holistic approach to the diverse exposures of dealerships. They focused on strategic loss prevention measures to reduce exposures and improve safety, while reducing the cost of claims through effective managed care and return-to-work strategies. To reach these results, the VADA GSIA team needed to address several unique and emerging challenges. Diverse Exposures and Cultures The first challenge was addressing the diverse safety hazards at auto dealers. In the Parts Shop, employees are exposed to strains from handling heavy parts, slips and falls, and cuts and scrapes. Plus, delivery drivers face the risk of auto accidents. In the Service Shop, exposures include eye injuries from flying debris or chemicals, strains from tire and parts handling, burns, slips/falls, and a large number of cuts and scrapes. The sales staff also experiences surprisingly severe claims, such as auto accidents and slips and falls due to snow, ice and rain, as well as strains from moving vehicles and equipment like sales tents. Even the business, accounting and office staff suffer from slips and falls. Secondly, VADA GSIA was challenged with integrating the nearly 300 independent dealers into one workers’ compensation culture. Dealers are scattered throughout Virginia and VADA GSIA members range from small, single-location, family-run dealerships to multi-dealership groups with no cohesive structure to large, regional operations with a strong corporate structure governing several locations. A comprehensive, VADA GSIA-specific website of workers’ compensation resources that reflect the diversity of dealers’ exposures, including more than 100 safety and injury prevention education materials, and put a wealth of tailored, loss prevention resources at the dealers’ fingertips. •	“High-Octane” Video email blasts to members embedded with two-minute videos focusing on safety and loss prevention matters. •	“Shop Talk” training videos designed for service, parts and body shop managers to use in safety meetings with employees. Finally, VADA GSIA was faced with work practices and attitudes that sometimes get in the way of employees working safely. For example, service technicians are paid on “service turned”; that is, they are paid per task for a standardized number of hours. If the manufacturer’s service manual says it takes two hours to change an alternator, and the technician completes the change in one hour, they still get paid for two hours of work. If any safety precaution threatens to slow them down, they are likely to skip it. Communication is Key to Preventing Injuries To address these exposures, VADA GSIA needed to create a culture of safety that overcame workplace obstacles across its diverse membership. VADA GSIA determined that communication needed to be consistent and sustainable. It also needed to make it easy for dealerships to manage safety within their businesses – providing innovative resources so managers did not need to perform as public speakers and teachers on safety topics. •	E-newsletters that consistently communicate strategies to keep workers safe and the bottom-line value of safety initiatives in reducing workers’ compensation claims. •	“Basic Safety Rules for Automobile Dealers,” a safety booklet that reinforces basic loss prevention and reduction concepts. This comprehensive and popular resource uses graphics and text to teach workers about the safety considerations particular to working in an auto dealership. •	“Dealer University” sessions – day-long seminars in a convenient Virginia location where dealers come together to discuss topics ranging from human resources to loss control. These efforts had significant results. For example, VADA GSIA reduced “struck by” injuries by 19 percent from 2014 to 2016 by educating dealers about OSHA requirements on providing employees with Personal Protective Equipment (PPE) and enforcing its use. They helped dealers educate employees about using mechanics gloves, safety glasses and other PPE, providing sample written policies, a safety video and other resources. With two dedicated specialists from PMA Management Corp., the VADA GSIA increased the number of visits/assessments from 340 in 2012-213 to 484 in 201516, a 42 percent increase. Each dealer now receives a visit from a risk control consultant at least once every 12 months. These consultants conduct a safety review of facilities, review claims history and identify opportunities for improvement. handling, pushing a vehicle, etc.). As a result, they detected an uptick in tire handling strains in 2016 and developed additional resources – including Shop Talk videos – to address them. Assistance Dealership risk control visits and risk assessments are an important part of how VADA GSIA supports worker safety efforts among dealerships. While these visits were implemented years earlier to address safety issues and prevent OSHA fines, over the last five years, the visits have become more frequent and thorough. Following the visit, dealers receive an assessment to help them understand how they rate on measures of management, safety procedures, general building conditions and safety in the service, parts and body shop departments. Frequency ratings, based on the OSHA incident rating, and severity ratings, based on the dealer’s loss ratio, are also compared against industry-recognized benchmarks. Any dealership not meeting expectations receives more frequent, focused visits. These visits and assessments played a big role in reducing the frequency of slips, trips and falls by one third from 2014 to 2016. During the visits, VADA GSIA and its TPA reviewed housekeeping, immediate spill clean-up and oil containment, and then helped dealers develop a housekeeping plan and monthly safety checklist. A key component to the success of these visits and assessment was VADA GSIA’s ability to overcome the perception among dealers that they were punitive measures. VADA communicated these visits as a value-added benefit of choosing the group for workers’ compensation insurance, focusing on helping dealers protect workers and avoid OSHA visits and fines. More managers now look forward to these visits as an opportunity to gain insights that help them save money. Additional support is provided for high-risk dealerships—those who do not meet the benchmarks of frequency and severity – through a Risk Assistance Program (RAP). VADA GSIA’s TPA has two dedicated consultants working with the dealership’s upper management to create a detailed, specific plan for addressing worker safety issues and hazards, and communicates the plan to every manager, with each held accountable. •	Claims reps and nurse case managers provide ongoing medical management for the injured worker, while pharmacy nurses focus on managing narcotics trends. •	If needed, a nurse case manager is available for assessments for lost-time claims and provides support for serious, medical-only claims. •	Nurse clinical evaluations are used to assess the appropriateness of treatment. •	The TPA negotiates savings and discounts with specialty provider networks, PPO networks and out-of-network providers. Physician panels are another key component of cost control. Since many VADA GSIA members were not keeping their panels up-to-date or readily accessible, VADA GSIA set up an “auto generation” program that automatically generates new panels on April 1 and October 1, distributing them by email to members, customized for each location. VADA GSIA has also helped shape workers’ compensation reform in Virginia, where workers’ compensation costs are high compared to many other states. Led by Michael Allen, VADA GSIA took this challenge to the state legislature and a new medical fee schedule has been adopted by Virginia, effective January 1, 2018. Providing Education through a Return-to-Work Program As part of an overall focus on claims resolution, the VADA GSIA emphasizes the importance of returning injured workers to work as soon as medically indicated. VADA GSIA encourages dealers to develop a written return-to-work program so they have an advance plan. During risk control visits, their TPA consultants discuss job duties that might be transitional duty. Claims reps also work with the dealership management to encourage light or transitional duty when an injury occurs. carefully monitors data to see if employees are out on lost-time claims and then calls managers to reinforce the benefits of returning to work and brainstorm creative solutions with them. In fact, Allen’s ability to establish a direct line of communication with dealer leadership and provide a nutsand-bolts perspective on the importance of safety initiatives and return-to-work strategies has been pivotal to VADA GSIA’s success. Conclusion VADA GSIA’s focus of preventing claims, reducing the cost of claims, and educating management and employees is paying off. VADA GSIA’s most recent success is rooted in commitments it made to safety nearly 20 years ago, spending up-front for a program that would improve safety and reduce claims costs for years to come. As a result, dividends have been returned to workers’ compensation program members every year since 2007, and now total more than $23 million over this period. This proactive approach will continue to not only pay dividends in dollars but in workers’ safety for years to come. Frank X. Altiere III is president of PMA Management Corp., part of PMA Companies (www. pmacompanies.com). PMA Management Corp.is a third party administrator that provides claims administration, medical savings programs, risk control services and loss management services. Mr. Altiere has nearly 40 years’ experience in the risk management industry and has earned CPCU, RIMS Fellow, ARM, AU, IIA, AIS designations. Contact him at Frank_Altiere@ pmagroup.com. IRS QSEHRA Guidance Leaves Many “Gotchas” for the Unwary Small Employer At the end of 2016, Congress included a provision allowing certain small employers an opportunity to help employees purchase individual market major medical coverage and pay for other medical expenses through tax-favored health reimbursement arrangements. The new health reimbursement arrangement vehicle, called a Qualified Small Employer Health Reimbursement Arrangement (QSEHRA), has significant limitations under current tax provisions, and may not be appropriate for all small employers. Recently, the IRS issued comprehensive Q&A guidance addressing many of the compliance issues affecting QSEHRAs in the form of IRS Notice 201767.1 We cover that guidance, as well as some of the more significant QSEHRA compliance requirements below. direct employer contributions (meaning that no employee salary reduction contributions are permitted), nondiscrimination rules, and a provision prohibiting employers from maintaining another group health plan. The top compliance concerns for an employer considering adopting a QSEHRA include: The employer must generally have fewer than 50 full time employees (including FT equivalencies) counting employees of controlled group members. Stated differently, the employer must not be an applicable large employer (NonALE). The employer (including controlled group members) cannot offer, sponsor, or endorse any other group health plan coverage including medical, vision, dental, or supplemental health indemnity (e.g., cancer, hospital indemnity, etc.) coverage. The employer cannot pay for or endorse (to the point of being an ERISA covered benefit) any individual health or medical insurance benefit. The employer must fund the QSEHRA with real employer contributions (not salary reductions) – meaning that the employer must actually pay for the cost of individual medical coverage; any additional employee contributions must be on an after-tax basis. The employer is required to have the employee substantiate: i) that all QSEHRA participants (including dependents for whom a reimbursement is paid) have minimum essential coverage (MEC) either through the QSEHRA purchased policy or another source; and ii) that an eligible medical expense was incurred for any reimbursements through the QSEHRA to be tax free. Additional tax (PCORI fee) and reporting (W-2 reporting of QSEHRA benefit) is required as well as a new notice describing the QSEHRA benefit. The employer must adopt and maintain a QSEHRA qualified HRA plan document. If there is any outside administration of the QSEHRA arrangement, or if the QSEHRA has more than 50 participants (e.g., due to participation by parttime employees), the employer must comply with HIPAA’s privacy and security requirements, which include adoption and maintenance of HIPAA privacy and security policies and procedures. State law should be checked to ensure that employer participation with individual medical policy coverage is permissible. Some states consider individual health insurance paid for by employers to be group health insurance. Thus, insurers, brokers and agents working with small employers should carefully consider statelaw implications, which might include prohibitions against marketing individual policies to small employers. Some states specifically prohibit employers from reimbursing individual premiums. The QSEHRA provision is designed to overrule agency guidance under the ACA prohibiting employer arrangements that seek to pay or reimburse the cost of individual market major medical insurance purchased by employees. This guidance specifically provides that stand-alone health reimbursement arrangements (HRAs), meaning HRAs that are not integrated with another ACA compliant group health plan, are not permitted.2 While these restrictions are not clear from the statutory provisions of the ACA, regulations and other administrative guidance preclude this type of arrangement on the basis that they violate one or more ACA requirements applicable to group health plans, in particular, preventive care requirements and/or the prohibition on annual and lifetime dollar limits on essential health benefits. these types of arrangements were subject to a $100 per person per day excise tax under Internal Revenue Code § 4980D (for private employers and churches) or a $100 per day penalty under Public Health Service Act § 2723 (for governmental employers). The Cures Act allows small employers to adopt this type of HRA arrangement, provided the requirements in the Cures Act are followed. QSEHRAs are not subject to the ACA market reforms and are not subject to COBRA requirements. (1) The employer is not an applicable large employer (ALE) as defined under the ACA employer responsibility penalties under tax code § 4980H. Under 4980H, ALE status is determined on a controlled group basis, so that for an employer to be eligible for a QSEHRA, the entire controlled group must collectively employ less than 50 full-time and full-time equivalent employees in the prior calendar year. (2) The employer (and any controlled group member) does not maintain a “group health plan” for any employees. The Cures Act does not specifically define “group health plan” for purposes of the requirement that a small employer adopting a QSEHRA cannot offer a group health plan to any employee. The definition of group health plan in the tax code is fairly broad and includes more than just major medical coverage. Unfortunately, the IRS FAQ guidance uses this very broad definition of health plan for QSEHRAs, meaning that ABSOLUTELY NO other health coverage can be sponsored or endorsed by the employer or any controlled group member of the employer. Reimbursement Strategies Chart your course for success with Payer Compass’s reputable, turnkey solutions. For more information, call (972) 964-6655 or visit payercompass.com. In general, a QSEHRA must be provided on the same terms to all eligible employees. Theoretically, the employer can vary the amount of reimbursements available under the arrangement based on age of the eligible employee (and family members if the arrangement covers family members) or the number of family members of the employee covered under the arrangement. However, any such variation must be made in accordance with the variation in price of an insurance policy in the relevant individual health insurance market. For this purpose, any variation must be determined by reference to the same insurance policy with respect to all eligible employees. Due to the administrative complexity of such a process (especially where, as noted above, a single carrier cannot be required), most employers will choose to provide a flat amount of QSEHRA benefit. health plans. Thus, an employer that fails to meet the applicable requirements could be subject to the $100 per person per day excise tax or penalty (as applicable). Coordination with ACA Premium Tax Credits There is a special rule for coordinating QSEHRAs with eligibility for premium tax subsidies. An employee who is provided a QSEHRA is not eligible for a premium tax credit if the QSEHRA is “affordable.” Affordability for this purpose is computed by looking at the self-only QSEHRA benefit in a manner similar for other employer coverage – i.e., looking to the amount of self-only permitted QSEHRA benefit made available, regardless of the amount paid. 15 The QSEHRA is considered affordable for a month if excess of the self-only premium under the second lowest cost silver plan offered in the relevant individual health insurance market over 1/12 of the employee’s permitted benefit under the QSEHRA does not exceed 1/12 of 9.5 (as adjusted for inflation) percent of the employee’s household income. purposes, the value of the coverage under a QSEHRA is the maximum amount of permitted benefit available under the arrangement to the employee and not the specific amounts reimbursed. Even though QSEHRAs are subject to the Cadillac tax, it seems unlikely that the tax would apply with respect to such arrangements, assuming that the tax does go into effect. This is for two reasons. First, the maximum permitted benefit is significantly less than the Cadillac plan tax thresholds, which are $10,200 for single coverage and $27,500 for family coverage. These are the amounts that would apply in 2018; the thresholds will be higher in 2022 and are indexed in subsequent years. In addition, because QSEHRAs are available only to employers that do not have another group health plan (other than possibly certain types of supplemental coverage), no other coverage of that employer is likely to push the value over the threshold. Patient-Centered Outcomes Research Trust Fund (PCOR) Fee Small employers who sponsor QSEHRAs must also file Form 720 and pay the PatientCentered Outcomes Research Trust Fund fee under Code § 4376 for plan years that end before October 1, 2019. The Form 720 is due on July 31 of the year following the last day of the plan year. The fee for plan years ending before October 1, 2018 is $2.38 per the average number of covered lives under the plan. If QSEHRA coverage does not meet the affordability standard, then the monthly premium tax credit is reduced by 1/12 of the annual benefit actually provided (e.g., self only or family as applicable) under the QSEHRA. See Notice 2017-67, FAQs 1-7 and 55. See Notice 2017-67, FAQ 55. Solely for QSEHRAs, the Cures Act reduces the Code Section 105 requirement from 3 years to 90 days. See Notice 2017-67, FAQs 8-11. See Notice 2017-67, FAQs 75. See Notice 2017-67, FAQs 48 and 63. See Notice 2017-67, FAQs 54 and 63. See Notice 2017-67, FAQs 44-45. See Notice 2017-67, FAQs 35-39. IRS Notice 2017-67, Q/A 57 – 64. IRS Notice 2017-67, Q/A 65 – 71.
roup health and workers’ compensation insurance have long operated in silos, but several factors have conspired to force a warped convergence with unintended consequences. They include burgeoning growth in high-deductible health plans (HDHPs), rising out-ofpocket costs and uncertainty about health care reform – all of which may be fueling workers’ compensation fraud. The upshot is that many working Americans financially squeezed by cost-sharing strategies misrepresent non-work injuries or conditions to reap more generous benefits. While no formal research has been commissioned to support this hypothesis, it’s on the radar of a leading watchdog group that, along with industry observers, has seen anecdotal evidence take shape. The Coalition Against Insurance Fraud predicts this troubling trend will continue to catch fire in the absence of meaningful steps to make group health coverage more affordable. “The migrating of risk from health insurance to workers’ comp policies is a phenomenon in progress, but insurers are watching very closely to see how they are being affected,” says James Quiggle, a spokesman for the group. However, there’s another nuance to the cost-shifting debate that needs to be assessed. Choosing an HDHP not only saves about $500 a year, it also produces lower maximum total health care spending roughly two-thirds of the time, according to a National Bureau of Economic Research analysis. The suggestion is that while employees pay more out of pocket, those expenses are offset by employer contributions to health savings accounts (HSAs) or premium assistance. Irrespective of whether such fraudulent activity waxes or wanes, this apparent moral dilemma presents self-insured employers with a strategic opportunity. To wit: unite benefits management and risk management, as well as integrate cultures of health and safety. But with a more thoughtful approach to hiring and maintaining morale seen as critical to building employee trust and loyalty, it’s as much a human capital concern as anything else. HDHPs are often coupled with HSAs that allow consumers to pay for eligible medical expenses with pretax dollars, as well as benefit from more choice and control over their care and coverage. But she cautions that HDHPs “are only one type of health plan option among many, and may not be the best option for everyone.” Her larger point is each individual and family must select a plan that best fits them. As many as 58% of 1,000 Americans recently surveyed by Luntz Global Partners for AHIP prioritize comprehensive benefits over affordability of coverage at 42%. In addition, 71% were found to be satisfied with their employer-provided health coverage, which 56% said remains a key factor in choosing to stay at their current job. More than 180 million Americans receive coverage through their employer. And indeed they have become more aware of work comp fraud through claim audits, especially over the past two years, reports Jim Marasco, a partner with StoneBridge Business Partners, which provides litigation support for insurers on evaluating loss claims. “They’re looking to have somebody independent come in and really scrutinize what they’re actually paying because it is obviously coming out of their pockets,” he says, noting that it’s best to bring in a specialist rather than rely on a TPA to do that work. Invariably, that process of discovery may cast a bright light on recruitment challenges. For example, Marasco notes that hiring practices in transient areas with high turnover that may be more prone to fraudulent claims. Self-insured employers should be the most concerned about a migration of non-work injuries and risk with the workplace because it comes straight out of their corporate coffers, Quiggle observes. The Practical Impact of Ariana M. v. Humana Health Plan of Tex., Inc. on ERISA Denials of Benefits By Patrick Ouellette, Esq. Prior to this decision, every other circuit court except the Fifth Circuit had applied a de novo review when an ERISA plan document does not expressly grant discretion to plan administrators. These courts based their rationale on the fact that the famed Firestone Tire & Rubber Co. v. Bruch case does not make a distinction between a trustee’s legal interpretations versus their factual decisions regarding the requirement for de novo review. Ariana M. v. Humana Health Plan of Tex., Inc. is legally significant because Fifth Circuit had long held that, under ERISA, a plan administrator was entitled to an abuse of discretion standard of review with respect to its factual determinations. In short, the court to this point had given plans the benefit of the doubt for factual determinations unless the plan had made an unreasonable decision. Now these administrators will be held to the de novo standard, without deference to its factual findings. This shift the court considering an issue for the first time without this deference will likely affect how and under what circumstances plan decisions are made. Thus, it is critical to also consider the practical impact that the holding will have on plan administrators that have relied for years upon Fifth Circuit providing them with this high degree of discretion in making factual determinations even when a plan has not expressly granted them that discretion. Fifth Circuit Standard of Review Background Employers, and the plan administrators, traditionally have broad discretion to determine how plan terms will be used, as well as to decide which entities will have the authority to make benefits determinations, factual determinations, appeals determinations, and language interpretations. The Supreme Court in Firestone held that only if a plan explicitly delegated authority to a plan administrator, the decision would be reviewed under a heightened “abuse of discretion” standard. The Court famously stated a “denial of benefits challenged under § 1132(a)(1)(B) is to be reviewed under a de novo standard unless the benefit plan gives the administrator or fiduciary discretionary authority to determine eligibility for benefits or to construe the terms of the plan.” If there was no express delegation, however, the Court held that courts would need to review a denial of benefits challenged under ERISA using a de novo standard. The holding did not directly clarify whether it was referring to both legal interpretations and factual determinations for the de novo standard. In Ariana M. v. Humana Health Plan of Tex., Inc., the Humana Health Plan of Texas argued that it had a discretionary clause granting to Humana “full and exclusive discretionary authority to: [i]nterpret plan provisions; [m]ake decisions regarding eligibility for coverage and benefits; and [r]esolve factual questions relating to coverage and benefits.” Due to a Texas antidelegation statute making discretionary clauses unenforceable, Humana agreed not to use the argument that the plan document gave it direct authority. Notably, the court remained silent on whether ERISA preemption came into play because Humana did not raise the argument. Instead, Humana relied upon the Fifth Circuit’s holding in Pierre v. Conn. Gen. Life Ins. Co. to argue that for factual determinations under ERISA plans, the abuse of discretion standard of review is the appropriate standard and therefore it had not abused its discretion in making its determination. The Fifth Circuit granted en banc review to reconsider Pierre and determine the default standard of review that would apply in these situations. The Fifth Circuit’s decision in Ariana v. Humana Health Plan of Texas essentially reversed its own interpretation of Firestone in Pierre. According to Pierre, without delegation of authority to a plan administrator, challenges to a legal interpretation of a plan should be considered under a de novo standard of review while factual determinations were to be under an abuse of discretion standard of review. The Pierre court based its reasoning on the concept that an administrator’s factual determinations are inherently discretionary and the Restatement (Second) of Trusts supports giving deference to an ERISA plan administrator’s resolution of factual disputes even when the plan does not grant discretion. The Ariana court essentially held that Pierre’s interpretation is no longer good law, despite some strong dissenting opinions, including from Judge E. Grady Jolly, who authored Pierre. The dissent focused its dissatisfaction with the majority’s opinion on the discrepancy between legal analysis and credibility determinations and a lack of express authority in Firestone. Factual Determinations That May Now Be Subject to De Novo Review Now that Ariana held that Firestone’s default de novo standard applies when the denial is based on a factual determination, it is worthwhile to see how this change would play out in the types of factual determinations that plan administrators make on a regular basis. This is not intended to be an exhaustive list of decisions that will be affected, but instead meant to illustrate the types of complications that Ariana could create for plan administrators if they are a party to case that reaches the Fifth Circuit. First and foremost, Humana Health Plan of Texas in Ariana used its discretion to decline to allow partial hospitalization for Ariana beyond June 5th, claiming it was no longer medically necessary. Using Pierre’s precedent, the district court concluded only that “Humana did not abuse its discretion in finding that Ariana M.’s continued treatment at Avalon Hills was not medically necessary after June 4, 2013.” Plan administrators are often making factual decisions as to whether treatment is “medically necessary” and therefore whether it should provide coverage according to the terms of the plan document. In the Fifth Circuit, these plans were granted broad deference regarding these determinations because of its decision in Pierre. Similar to the rest of the circuit courts, medical necessity determinations are now subject to de novo review. However, Ariana is merely the tip of the iceberg in that these types of factual determinations are not limited only to questions of medical necessity. Another determination in which plan administrator discretion is paramount is the application of plan document exclusions, such as excluding coverage if the treatment or care was the result of illegal or hazardous activity. Each plan document has its own set of exclusions that it can choose whether or not to apply to a given set of facts, but the Fifth Circuit had traditionally separated itself from the rest of the circuit courts up until this point as to the standard by which these exclusion determinations would be judged. Anyone who works in the self-funded industry knows how controversial and fact-dependent the practice of excluding participant claims can be for a plan administrator. Without an abuse of discretion standard and de novo standard now in place, however, these administrators may potentially be more wary to automatically exclude a plan participant’s claims due to an illegal or hazardous activity exclusion if, for example, the facts are unclear. Next, plan administrators often make plan eligibility decisions that will be affected by the Ariana decision in the Fifth Circuit. These determinations will include, for instance, whether spouses are eligible for coverage after they dropped their own plan based on the plan’s eligibility language. Previously free from the potential second-guessing involved in with the de novo standard of review, administrators now more than ever will need to be sure to document their coverage decisions based on the plan document language and be able to defend them in court if necessary. Administrators also make factual determinations regarding administration of high-deductible health plans (HDHPs), health savings accounts (HSAs), flexible spending accounts (FSAs). Some prime examples of these administrative issues would be deciding which items covered under an HSA would be deemed “preventive” or whether the plan had avoided first-dollar coverage under an HDHP. Similar to the above, the Fifth Circuit will now view the process of how these factual decisions were made in a much different light. reminder that decisions made under this “new” standard of review will be used as precedent for its decisions made in the future as well, adding to the weight of these determinations. Patrick Ouellette, Esq. joined the Phia Group in 2017. He earned his B.A. in journalism and writing from the University of Rhode Island and spent time as a sports writer and also as a healthcare technology journalist. He later graduated from the Suffolk University Law School evening program with a health and biomedical concentration with distinction. Patrick has legal experience with healthcare providers and in state government. He was also a published staff member of the Suffolk University Law School Journal of Health and Biomedical Law and later served as Chief Content Editor on the journal’s executive board. Finally, now that these plan administrators are subject to the de novo standard of review instead of abuse of discretion review, they should remember the ERISA requirement that factual determinations must be made consistently in similar scenarios in the future. Though this is not necessarily a novel consideration for plan administrators, it is a worthwhile • In business since 1984, Medical Risk Managers, Inc. is the largest stop loss underwriter in the country. • Historically, MRM has underwritten over $3 billion in stop loss premium. • We currently underwrite over $200 million of annualized stop loss premium. • 9 out of the 12 largest stop loss carriers have trusted MRM to underwrite on their paper. • MRM has consulted with over 40 insurance companies and MGU’s. • MRM maintains complete SOC1 and SOC2 Type 2 compliance. In Delaware, the captive regulators are dedicated exclusively to our captive insurance clientsâ&#x20AC;&#x2122; needs, and work under the direction of our Captive Bureau leadership, directed by Steve Kinion. London Market and Employer Stop-Loss – Then, Now & the Future with Charlie Boyd, Senior Underwriter at Ark Syndicate Management Ltd., Stuart Liddell, Senior Vice President of Sirius America and J. Brady Young, President & CEO of Strategic Risk Solutions, Inc. Lloyd’s role as a risk transfer partner for the U.S. employer stop-loss market has changed significantly over the past decade and may evolve further in future years. This panel discussion will offer expert insights and commentary on the evolution of this transcontinental specialty insurance market. Solvency II & the Impact on EU-Based Captive Insurance Companies Stuart King, President and CEO of Strategic Risk Solutions (SRS Europe) and Malcolm Cachia, ACII, General Manager of Ark Insurance Management PCC Limited will provide an update on how EU-based captives have been adapting to the Solvency II regulatory scheme. Introduction & Update --The U.S. Self-Insurance Marketplace with Lawrence Thompson, CEO of Inventavis. This session is designed especially for UK and EU-based attendees to provide a basic understanding the U.S. self-insurance/captive insurance marketplace, including the latest business trends and potential partnership opportunities for UK and EU-based companies. European Insurance/Reinsurance Market Post BREXIT featuring Ben Speers, COO of Miller Insurance Services LLP and Kenneth Underhill, Director at Implement Compliance Solutions & Resources Ltd. BREXIT is viewed by many as a gamechanger for the UK and EU economies, but how will it affect the insurance/reinsurance marketplace…and ultimately companies looking for alternative risk transfer solutions from these markets? A panel of experts will discuss and debate BREXIT implications for those involved in the self-insurance marketplace on both sides on the Atlantic. Lloyd’s has positioned itself as a key reinsurance market for U.S-based workers’ compensation risks. This session will provide the latest updates on these connected markets and trends to consider going forward. Captive Insurance Trends & the Lloyd’s Market with Les Boughner, Chairman of Advantage Insurance Management (USA) LLC The growth in captive insurance companies continues to accelerate in the United States and the EU, with Lloyd’s providing reinsurance for many captives. This session will discuss important captive insurance market trends and the connection to various Lloyd’s syndicates. Attendees will have many networking opportunities, and time has been built in the program schedule to accommodate private business meetings. Attendees will also have the chance to take a private tour of the Lloyd’s offices – truly an opportunity not to be missed! For more information and registration information, please visit www.siia.org. Discovering new things is not just for kids. NLA is changing how the industry manages workers’ compensation claims to lower your bottom-line. Discover how your data, our analytics and collaborating with our claims team will improve your results. Our team of experts is ready to put the power of data at your fingertips. Requirements MultiPlan, a leading healthcare cost management company, announced its data transmission and service portal applications have earned Certified status for information security by HITRUST. HITRUST CSF Certified status demonstrates that the organization has met key regulations and industry-defined requirements and is appropriately managing risk relating to these systems and infrastructure. This achievement places MultiPlan in an elite group of organizations worldwide that have earned this certification. By including federal and state regulations, standards and frameworks, and incorporating a risk-based approach, the HITRUST CSF helps organizations address these challenges through a comprehensive and flexible framework of prescriptive and scalable security controls. MultiPlan is committed to helping healthcare payers manage the cost of care, improve their competitiveness and inspire positive change. Leveraging sophisticated technology, data analytics, and a team rich with industry experience, the company interprets clients’ needs and customizes innovative solutions that combine its payment integrity, network-based and analytics-based services. MultiPlan is a trusted partner to over 700 healthcare payers in the commercial health, government and property and casualty markets, and saves these companies more than $15 billion annually. MultiPlan is owned by Hellman & Friedman and other investors. For more information, visit multiplan.com. coverage; portability, if the insured chooses to continue their coverage when employment is terminated; and self-administered billing for the employers’ ease of administration. The product can also be included on virtually any enrollment platform or benefits administration system. “We’ve learned a lot from both our employer and employee customers over the years and based on their feedback, we revamped this product to make it easier for our end consumer, the employee, to understand and included the features they value most,” said Rob Grubka, president,Voya Employee Benefits. “Our new Compass Critical Illness Insurance goes beyond just a payout and includes options to help insureds get through some of the complexities that come along with a critical illness diagnosis.” To partner with companies’ efforts to improve the overall health and morale of its employees, employers that include wellness programs for their employees may select the new Health Reward Increase Benefit option. This option gives employees participating in their company-sponsored wellness program an opportunity to earn an annual increase to their Compass Critical Illness Insurance benefit amount. To help address both the physical and financial toll a critical illness can take, Voya Employee Benefits also now offers the Compass Care Package as an option the employer may choose with Compass Critical Illness Insurance. This option provides counseling and support to help insured employees and their families more easily understand the benefits, billing and other resources related to the diagnoses and treatment of the critical illness. “We all know someone who has dealt with a critical illness. Sometimes the complexity of diagnoses, billing and other paperwork can take a toll on the insured and their loved ones, when they should be focusing on their wellness,” said Grubka. “The Compass Care Package helps round out our insurance product by guiding people, as well as helping them find emotional and educational support.” Voya Employee Benefits’ Compass insurance products offer “voluntary” or employeeselected coverage that is processed and administered similarly to traditional group insurance. With Compass Critical Illness Insurance, employers may choose to fund the plan for their employees; offer it as an option employees can purchase through their workplace benefits; or create a combined option in which the employer pays a portion of the benefit and the employee can purchase additional coverage. Voya’s Employee Benefits business offers stop loss, group life, voluntary benefits and disability income insurance products to employers and their employees. The business has extensive experience in the design, implementation and administration of employee benefits plans, and it offers a full range of supplemental voluntary products that include critical illness, accident and hospital confinement indemnity insurance. As an industry leader and advocate for helping Americans retire better, Voya Financial is committed to delivering on its vision to be America’s Retirement Company®, and its mission to make a secure financial future possible – one person, one family, one institution at a time. ELAP Services, LLC, a leading healthcare solution for self-funded employers across the U.S., has been named No. 9 on The Philadelphia Inquirer’s “Top Workplaces 2018” list in the small-size company category (50 to 149 employees). The list ranks leading employers in the Philadelphia region based on a survey of employee feedback. About Voya Financial® Voya Financial, Inc. (NYSE: VOYA), helps Americans plan, invest and protect their savings — to get ready to retire better. Serving the financial needs of approximately 14.7 million individual and institutional customers in the United States, Voya is a Fortune 500 company that had $8.6 billion in revenue in 2017. The company had $555 billion in total assets under management and administration as of Dec. 31, 2017. With a clear mission to make a secure financial future possible — one person, one family, one institution at a time — Voya’s vision is to be America’s Retirement Company®. Certified as a “Great Place to Work” by the Great Place to Work® Institute, Voya is equally committed to conducting business in a way that is socially, environmentally, economically and ethically responsible. Voya has been recognized as one of the 2018 World’s Most Ethical Companies® by the Ethisphere Institute, one of the 2018 World’s Most Admired Companies by Fortune magazine and one of the Top Green Companies in the U.S. by Newsweek magazine. For more information, visit voya.com. Follow Voya Financial on Facebook, LinkedIn and Twitter @Voya. ELAP employees completed a comprehensive survey about their position, the ELAP executive team and work environment. Employees named their passion for the ELAP mission to rationalize healthcare costs and advocate for families, the supportive culture focused on developing individuals and the inspirational leadership of the CEO as to why ELAP was worthy of the Top Workplaces recognition. We know that offering straight-forward guarantees, removing impossible caveats and providing an honest representation of our capabilities are the only ways to establish and maintain long-term relationships with our clients. At Script Care, transparency is how we work ... everyday. Contact us at (800) 880-9988 or visit www.scriptcare.com to find out more ! “ELAP is honored to be named in the top 10 small-business workplaces in the Philadelphia region, and I’m inspired that the results reflect our employee’s opinions about our company,” said ELAP Co-founder and CEO Steve Kelly. “At ELAP, we believe in fostering a community in which our employees are passionate about a common mission: making healthcare fair. Our goal is to empower all of our 137 employees, so that they know that we value their work. It’s rewarding to know that we’ve successfully created a company culture that our employees can rally behind. We can feel confident that they’ll bring that productivity forward to provide the best possible service to ELAP clients nationwide.” ELAP offers a variety of benefits to its employees, including a comprehensive healthcare package, with 100 percent paid costs of medical, vision and dental coverage, and 60 percent of dependent coverage. The company also supports employee philanthropic efforts through monetary donations and volunteerism, provides surprise gift celebrations and a kitchen stocked with snacks. ELAP also has an annual tradition of awarding an all-expense paid vacation to an employee who has been nominated by other team members for going above and beyond in representing the company’s values. ELAP plans to continue to grow its workforce and fill up to 50 open positions in 2018 in areas of client services, operations and information technology (IT). The Philadelphia Inquirer’s “Top Workplaces” is administered by research partner Energage, LLC, and for the 2018 list, the group surveyed more than 36,000 people and recognized 125 employers. About ELAP Services, LLC ELAP Services is a leading healthcare solution for self-funded employers across the U.S., offering unparalleled cost savings and advocacy services. ELAP’s full-service program works in conjunction with a company’s health plan to promote the responsible and sustainable management of healthcare costs. ELAP’s services include plan design, claims auditing, member advocacy and legal defense, and emphasize collaboration and strengthening partnerships. ELAP builds meaningful connections with employers, members, and hospitals and health systems, to ensure a fair price for quality healthcare. Visit www.elapservices.com. Cottrill’s Specialty Pharmacy ACHIEVES ACCREDITATION WITH ACHC and URAC Cottrill’s Pharmacy proudly announces its approval of accreditation status by Accreditation Commission for Health Care (ACHC) for the services of Specialty Pharmacy and Home/ Durable Medical Equipment Services. Cottrill’s Pharmacy also has been awarded full accreditation for Specialty Pharmacy with URAC Achieving accreditation is a process where healthcare organizations demonstrate compliance with national standards. Accreditation by ACHC and URAC reflects an organization’s dedication and commitment to meeting standards that facilitate a higher level of performance and patient care. “The development of new, complex, and costly drugs makes good patient management an imperative. This makes accrediting pharmacies that manage patients more important than ever. We applaud Cottrill’s Pharmacy on achieving an accreditation of the quality of their pharmacy services through URAC,” said URAC President and CEO Kylanne Green. “Cottrill’s shows a dedication to patient education and safety through the recognition of quality it received with URAC’s independent accreditation.” Cottrill’s Specialty Pharmacy is an independent pharmacy licensed in 47 states and has been servicing patients since 1899. Cottrill’s specializes in the treatment of chronic conditions, genetic disorders and rare diseases. ACHC is a not-for-profit organization that has stood as a symbol of quality and excellence since 1986. ACHC is ISO 9001:2008 certified and has CMS Deeming Authority for Home Health, Hospice and DMEPOS. URAC is a nonprofit organization developing evidence-based measures and standards through inclusive engagement with a range of stakeholders committed to improving the quality of healthcare. URAC accreditation is a symbol of excellence for organizations to showcase their validated commitment to quality and accountability. For more information, please visit www.cottrillspharmacy. com, or contact patientcare@ cottrillspharmacy.com or 716-5088481. Custom Design Benefits Expands into Columbus, Ohio Market Central Ohio employers that select Custom Design Benefits to administer their selffunded employee health plans now have access to a reference-based reimbursement plan that includes direct contracting with Mount Carmel Health, one of the largest hospital systems in Columbus. Direct contracting arrangements cover the amount an employer’s health plan will reimburse providers for medical services. The Custom Design Benefits product called TrueCost sets reimbursements on a costplus basis versus the standard preferred provider organization model of a discount on billed charges. Benefits for self-funded employers, said Amanda Guinan, CDB’s vice president of business development and compliance. About Custom Design Benefits Custom Design Benefits is the fifth-largest employee benefits firm in Greater Cincinnati, according to Business Courier research. CDB claims to be Greater Cincinnati’s largest independent third-party administrator of self-funded health benefit plans and consumerdriven services. Established in 1991, CDB administers self-funded health plans for more than 110 Greater Cincinnati employers. The Green Township company has another 450 clients in its consumer-driven services division, which includes those who rely on the firm for compliance services such as leave administration/FMLA and COBRA administration. Visit www.customdesignbenefits. com. care, program development, quality improvement, claims issues and educational needs. •	Bachelor’s Degree with 5 years of related experience, or equivalent combination of education and experience. •	5+ years of clinical and case management experience preferred. •	RN license required, CCM preferred. •	Ensure effective risk management. Perform reviews, assessment of new business, and renewal large claims/disclosure to identify known and potential risk. •	Assist underwriters in the evaluation and assessment of clinical and claims data to identify and quantify known and potential risk through the provision of concise, detailed, and accurate reporting of data analysis findings, observations and recommendations to underwriting. Gold Members Nationwide Innovative Solutions is Now a SIIA Gold Member The Self-Insurance Institute of America, Inc. (SIIA) today announced that Nationwide Innovative Solutions has upgraded to SIIA Gold member status, confirming the companyâ&#x20AC;&#x2122;s leadership position within the self-insurance marketplace. This latest membership announcement is part of an ongoing strategic initiative to increase membership support of the association so that it is better positioned to protect and promote the business interests of organizations involved in the self-insurance/captive insurance marketplace. Upgraded members (Silver, Gold, and Diamond) receive a variety of additional membership benefits. Details can be accessed online at www.siia.org, or by contacting SIIA Membership Director Jennifer Ivy at jivy@siia.org. Learn more about Nationwide Innovative Solutions by contacting Tom DeNoma at denomat@nationwide.com. SIIA New Members Do you aspire to be a published author? Do you have any stories or opinions on the self-insurance and alternati ve risk transfer industry that you would like to share with your peers? We would like to in vite you to share your insight and submit an article to The Self-Insurer ! distributed in a digital and print format to reach over 10,000 readers around the world. The Self-Insurer has been delivering information to the self-insurance /alternative risk transfer community since 1984 to self-funded employ ers, TPAs, MGUs, reinsurers, stoploss carriers, PBM s and other service providers.